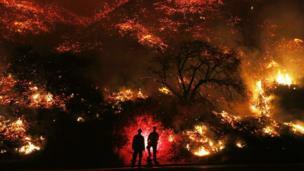 Firefighters have started to contain wildfires that have devastated southern parts of the state. 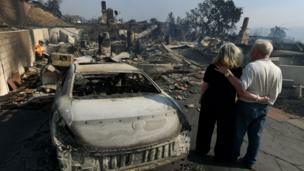 California is entering its sixth day battling dangerous wildfires. They have been driven by extreme weather conditions: low humidity, high winds and parched ground. Authorities issued a purple alert - the highest level warning - amid what it called "extremely critical fire weather". 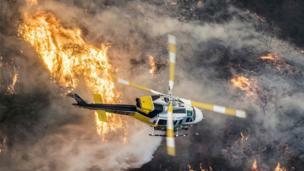 Fanned by high winds, six large fires, and other smaller blazes, swept through tens of thousands of acres in a matter of hours. 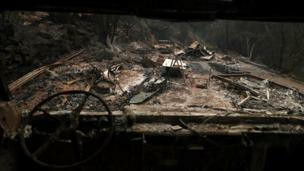 About 5,700 firefighters have been battling the fires, with many drafted in from neighbouring states to help. The Thomas fire in Ventura County is the largest, and has destroyed more than 430 buildings. 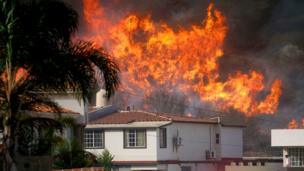 Three firefighters have been injured and hundreds of buildings destroyed. One death was reported after a 70-year-old woman was found dead in her car on an evacuation route. 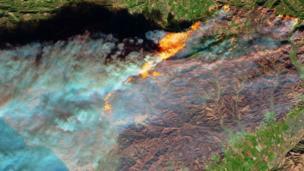 Satellite imagery shows the vast Thomas Fire, north of Los Angeles, which has spread as far as the Pacific coast. US President Donald Trump issued a state of emergency in response to the fires. 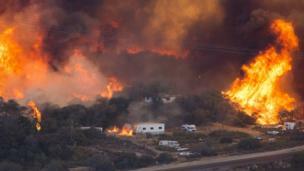 There are fears the blaze will hurt California's vast agricultural industry. Much of the state's avocado crop has been destroyed. About 90% of US avocados are grown in California and the industry is worth millions to the economy. 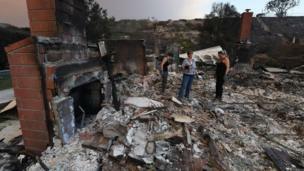 The fires have destroyed homes and scorched residential areas. 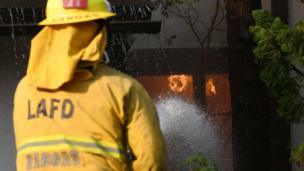 In the wealthy Los Angeles enclave of Bel Air, firefighters were seen removing belongings from luxury homes as the flames spread. Several evacuation orders were lifted on Friday afternoon, leaving residents free to return home and assess the damage.